This bull is an I-80 back on a Jake's Proud Jazz/Lifeline cow. He has a BW of 64 lbs. 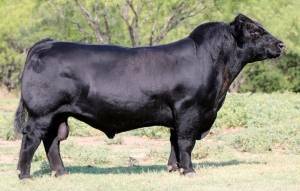 Critter has everything you look for in a bull, a round cage, great muscle shape and most importantly a reliable skeleton! This coupled with his added look make him a versatile choice. There is plenty of power backing him throughout his pedigree. He is a huge footed bull that offers flex and cushion to his pastern and still uses his hock with ease.